Reactive oxygen species (ROS) are by-product of aerobic metabolism, and their production is limited to cellular compartments with a strong electron flow. Aerobic metabolic processes such as respiration and photosynthesis result in the generation of ROS. ROS include hydrogen peroxide (H2O2), superoxide radicals (O2•−), hydroxyl radicals (OH•), and singlet oxygen (1O2). ROS exert a wide range of physiological responses in plants, along with changes in cellular structure, and they can cause oxidative damage to indigenous enzymes, proteins, and nucleic acids. This toxicity of ROS explains the evolution of complex arrays of nonenzymatic and enzymatic detoxification mechanisms in plants. An extraordinary advance in understanding the role of ROS in stomatal movement has been made by researchers. Stomatal movement is controlled by a multifaceted signaling network in response to endogenous and environmental signals. 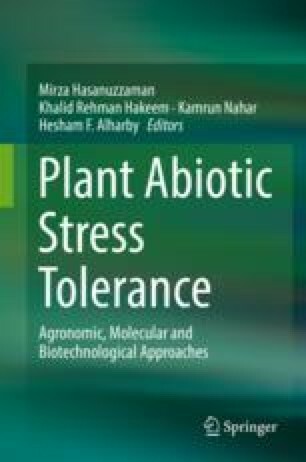 In higher plants, abiotic stress induces the formation of ROS, leading to a wide range of physiological changes, while biotic stress includes damage due to living organisms that cause diseases in plants. However, plants produce various natural products of a toxic nature to protect themselves against microbial pathogens, and these products are also important for communication between plants and other organisms. In this chapter, various roles of ROS and enzymes in plant responses to stress regulation and metabolism are discussed.